Calon Cardio-Technology is preparing to launch a 50-patient clinical trial of the UK's first artificial heart pump in 2018. Swansea University’s medical technology spin-out, which is based in the Institute of Life Science 2, has developed a miniaturised ventricular assist device (VAD) to directly implant into the left ventricle of a failing heart. Finance Wales and Innovate UK have supported in the development of miniaturised ventricular assist device. Innovate UK and Swansea University have provided a grant of £1.66m to collect the performance and safety data before applying to begin human clinical studies. Calon Cardio’s MiniVAD is said to assist the weakened heart instead of replacing it, which will have a significant effect on the patients. The new artificial heart pump will enable to slow down or advance heart failure, helping o extend the life of patients waiting for a heart transplant. The MiniVAD, which will run with the support of embedded electric motor, is powered by a battery pack worn by the user. It is a smaller and lighter pump, which needs less invasive surgery and causes less damage to the blood by allowing it to flow more softly. Calon Cardio chief executive Stuart McConchie said: “This is for a very sick group of people and there are millions of them in the world, and hundreds of thousands in the UK. 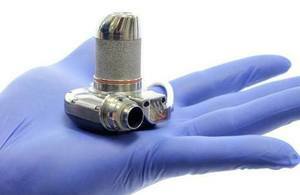 Image: Calon Cardio's MiniVAD is a smaller and lighter pump that requires less invasive surgery. Photo: courtesy of Crown copyright.